I miss my stacks. Nicely, neatly organized stacks of canned goods, chocolate chips, cake mixes, napkins and paper towels, cereal, gravy mixes, Crisco—if it kept well on a shelf, I had six or seven. For 26 years (most of my adult life), I lived in a beautiful rural setting that was at least seven miles from the nearest… anything. Store, gas station, restaurant, coffee shop. The only thing within hollerin’ distance was our white-steepled country church, but when you need a cup of sugar or a couple pounds of potatoes, church isn’t going to do you a whole lot of good. One Thanksgiving I was cooking the turkey for my young family when I discovered I was low on potatoes. Like, down to two. An early blizzard had made driving treacherous, and I knew the stores would be closed even if I could get out of our driveway. Then I saw my neighbors, who were supposed to be driving to another town for the holidays, pull back into their ranch down the road. I called Judy and found out they had turned around because of the icy roads, and no, they didn’t have anything prepared for Thanksgiving, and sure, they’d love to come over. So the seven of us had a wonderful time dining on turkey, pies, veggies, rice, and one spoonful apiece of mashed potatoes. It was one of the best Thanksgivings ever, but I never wanted to run out of anything again. My failsafe was to stock several of everything. I worked full time in town and had my hands full with two little boys, so I would rush to do my grocery shopping on the way home and fill the pantry with whatever was on sale and would last. The fewer trips to the store, the better. I loved the sight of my overflowing but neatly stacked shelves in the kitchen and, eventually, in a good-sized area of our large basement. You would have thought I was prepping for Armageddon. When I moved out of that house last year, I found the fruits of my overzealous labors tucked into the nooks and crannies of my basement shelves. I can tell you from experience that (a) when you move 1400 miles you do not want to burden your movers with canned goods, even if that tub of Crisco did cost $5; and (b) most of the stuff that’s been sitting on your shelves for ten years isn’t going to taste very good. Did you know sweetened condensed milk turns a lovely golden brown when it’s past its prime? Or that frosting in those little cardboard tubs goes rancid, even though it still may sport a beautiful shade of pink? Starting over in a new city—in the suburbs, where almost nothing is more than five minutes out of reach—has given me a new outlook on what might have been called “hoarding light.” I no longer have a plethora of shelves to fill or a basement or a full-sized, stand-alone freezer (there was stuff in there from the 1990s, no kidding). I have exactly one small pantry with a few shelves and a garage that is, at present, around 120 degrees Farenheit because that’s how garages are in Phoenix in the summer. It’s perfect for paper goods or chips and crackers (boy do they stay crispy!). Something about stacking items on shelves still appeals to me, though. I fight the urge to stock up whenever there’s a great sale on, say, canned tomatoes. I know I’ll need them for all the chili I’m going to make this fall and winter. I have to keep reminding myself that it takes exactly two minutes to drive to Fry’s. Two and a half to Safeway. Five to Target. Melt 7 oz. 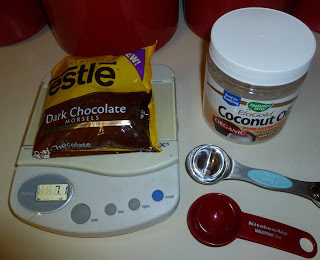 of chopped chocolate (or chocolate chips, if you aren’t picky—any type works fine) with two tablespoons of coconut oil. You can do this on the stovetop or in the microwave. If you’re nuking it, go slow, 30 seconds at a time. Stir after each 30-second interval. Two or three times should do it. Spoon it or pour it over your ice cream. The extra will keep in your cupboard just fine. I put mine in a covered Tupperware container and nuke it again, briefly, if it’s set up instead of liquid-y. I suppose when we move from this small rental into a larger home next year, I’ll have more pantry space. I may even buy a freezer. But somehow I’m going to resist the urge to stack stuff to the ceiling—I promise. And if I have too much, I can always have my toddler grandson unstack it all for me. It’s one of his favorite things to do, and hey, then I can have the satisfaction of re-stacking it all over again.